Our annual Historical Writing Competition recognizes the authors whose books have made the most significant contributions to the historical literature of British Columbia. 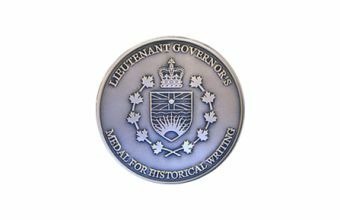 The top prize for this competition is the prestigious Lieutenant Governor’s Medal for Historical Writing (pictured at right), plus a $2,500 cash prize. Awards may also be presented to the runner up ($1,500), second runner up ($500) and/or honorable mentions (certificates). Since 2014, we have also presented the Community History Award to a book that provides sought-after historical information about a specific community or locality within British Columbia. This award recognizes the importance of preserving local histories as well as broader provincial histories. All books submitted to the Competition are considered for this award. Non-fiction books representing any aspect of BC history are eligible. Reprints or revisions of books are NOT eligible. Books must be published within the current calendar year, and must be submitted by December 31 of that year. Books may be submitted by authors or publishers. Applicants are required to submit three copies of their book for judging. These copies must be received by the BCHF Book Award judges by December 31 of the competition year. The Book Award Chair will contact you upon receiving your application to provide mailing instructions. Books entered become the property of the British Columbia Historical Federation. Note: By submitting books for this competition, authors agree that the British Columbia Historical Federation may use their name(s) in press releases and other print/electronic publications. Scholarship: quality of research and documentation, freshness of material, comprehensiveness, objectivity and accuracy. Presentation: organization, clarity, illustrations and graphics. Accessibility: readability and audience appeal. Awards are presented at the Awards Banquet at the Federation’s Annual Conference. Winners will be announced through media channels after the conference awards gala. Are you a past winner or finalist of the Competition? Embossed gold (winner) and silver (finalist) book seals, pictured at right, are now available for purchase. For information, please contact the Historical Writing Competition Chair. The Historical Writing Competition dates back to 1983. For information about the history of the Competition – including a list of past award recipients – please visit Our History – Awards – Historical Writing Competition.